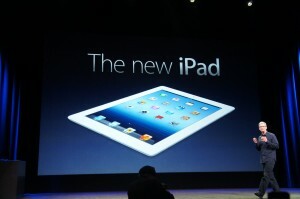 This morning Apple introduced a new iPad and with it has raised the bar for anyone creating a competitive tablet. The iPad, with its new Retina display that delivers 2048 X 1536 resolution, is clearly the highest definition tablet on the market. More importantly, as Apple pointed out, the work to create this type of HD quality experience on a tablet took many years of effort and tight integration with their new chip, which will make it very hard for competitors to match anytime soon. Apple has punched up the power of the new iPad with a custom version of their ARM processor called the A5x, which is a quadcore chip designed specifically to boost any image or video displayed on their new Retina screen. One only has to view the new iPad against an older iPad 1 or 2 to see the major differences between the products. And it is even more pronounced when you view it next to an Amazon Kindle Fire or any of the other tablets on the market with standard definition displays. With the new iPad display, there is no pixilation whatsoever on pictures and video and text in books is sharper then ones in any real book outside of those designed with high res text and images. And saturation of images and video are 44% greater then on the older model iPads. Apple also adds a new 5-megapixel camera that takes video in HD, has a much larger sensor then in past iPads and has a 5-element lens with backside illumination and an IR filter that gives amazing color and white balance. And a new dictation feature is now added to the keyboard making it easy to dictate words into a document quite accurately and easily. As expected, the new iPad also has an LTE option. It includes radios that cover EVDO (Verizon) HSPA GSM, HSPA+, DC-HSPA and LTE, which make’s it a world capable communications tool out of the box. And it will have the same battery life as iPads in the past. 10 hours for continuous use without LTE radio and 9 hours with. Prices are the same as on the older models, although Apple will now offer a 16-gig version of the iPad 2 for $399, a new price point for iPads and one that will make it available to a broader audience. And the design is about the same so it will work with most cases and peripherals without any changes. They are also introducing new apps from iPhoto to an updated iLife and an updated version of iMovie that allows for much finer creation tools to new ways to edit and distribute your movies via iCloud. And while all apps work with the new Retina display well, software developers can enhance their apps for even greater resolution to make them optimized for this new display. Software is clearly the key differentiator. The iPhoto demonstration alone will wow consumers and highlights the power of touch computing. All of this new technology integrated into the new iPad will have a major impact on the market for tablets. From now on, this iPad will be the standard all other tablets will be compared to. And with it should come an even greater opportunity for Apple to pad their lead in tablets. Of course, we expect that other tablet vendors will try and match Apple with higher resolution displays later this year. But if what Apple says is correct, their integration of both this custom display optimized for this new processor could make it hard for the competition to directly catch up anytime soon. I view Apple’s new iPad as a major advancement in tablet design and one that will have a major impact on the market for tablets. In business, the need for higher resolution tablets has always been strong, especially in vertical markets like medical, engineering, and even ones where handling a lot of data for viewing is important. At the very least, the new iPad should have even greater interest in the enterprise where Apple is already making major inroads. And consumers who watch movies and view their pictures on tablets will really be drawn to this HD experience, as the quality of their content will be the best on a new iPad. Although there will always be a market for lower cost tablets, with the new iPad Apple has introduced a new measurement to the decision process for users at any level. And this will cause some challenges for buyers this holiday season as I doubt that any competitor can even come close to having something competitive by then. That should give Apple a significant edge going into this holiday, as the iPad will clearly be the best tablet available bar none. Apple also introduced a new version of Apple TV. While many had hoped that Apple would introduce an actual TV, that was not in the cards. What Apple did release is a new version of Apple TV with a new UI and more importantly, support for 1080P HD content. This is a big advance and one that current Apple TV users have been asking for. The price stays the same at $99 and the new software includes the Genius function and a completely new UI making it much easier to find content and display it. This should also be a hot product going into the holidays as more and more people are opting for products like Apple TV and the Roku box to handle their on demand TV experiences and movie viewing and the new Apple TV should be a big hit for Apple.